A staff member and vistors enjoy pirate fun during a story time at the Greenfield Branch Library. October is the start of the holiday season here at the Greenfield library. We invite our young readers through fifth grade to register for our Polar Express reading program starting on Wednesday, Oct. 3. Come in, sign-up and pick up the rules and reading log. Upon completion, you will receive a ticket to board the Polar Express Experience at the Greenfield library on Saturday, Dec. 8 at 11 a.m. Details will be at the front desk. We also encourage all kids and teens to sign up for our trick-or-treat bag decorating contest starting on Wednesday, Oct. 3. Pick up a paper bag and create a unique trick-or-treat bag using any materials you wish. Return the bags by Saturday, Oct. 20. Judging for prizes will be held Monday, Oct. 22 and bags can be picked up prior to Beggar’s Night on Thursday, Oct. 25. We look forward to seeing the decorated bags at Beggar’s Night in downtown Greenfield, too. The Highland County libraries will be closed Monday, Oct. 8 in observance of Columbus Day. Please feel free to use our outside book drop to return items. Join us for our story times for kids preschool age and younger every Wednesday at 11 a.m. We will have songs, crafts, stories and other activities. Our themes this month include: Celebrate Pizza Month, Fire Prevention Day (fire trucks will be here), Donuts, Make a Difference Day and Happy Halloween (wear your costume). The Greenfield library also hosts a Seniors’ Exercise Class every Wednesday at 1 p.m. The class is presented by Edgewood Manor. So come on over and have some fun moving and grooving with us on Wednesdays. The library staff hopes you will stop in to visit with us and let us scare up a good book for you during the month of October. We look forward to seeing you soon. Sharon Aukeman is the branch manager at the Greenfield library. 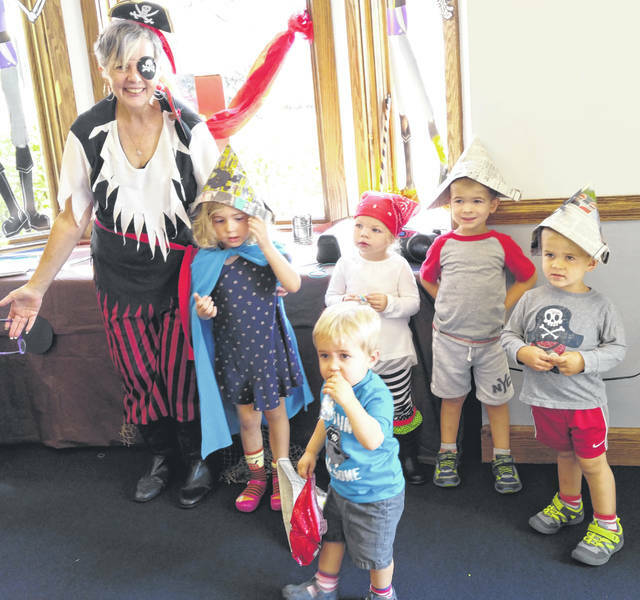 https://www.timesgazette.com/wp-content/uploads/sites/33/2018/10/web1_Greenfield-Library.jpgA staff member and vistors enjoy pirate fun during a story time at the Greenfield Branch Library.